Johannesburg – South Africans have raised more than R10 million in humanitarian aid to help desperate refugees in Syria, particularly in the beleaguered city of Aleppo. 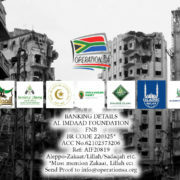 A pledge-line by the five-day old NGO #OperationSA raised R10 028 953 within five hours for the #SAveSyria campaign. 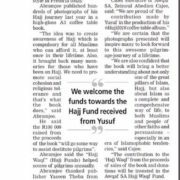 Scores of young children, some donating their spending money, also called in. 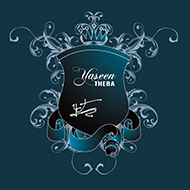 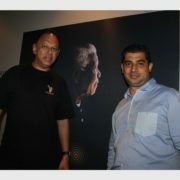 Yaseen Theba from #OperationSA said the pledge line was a “major success”. 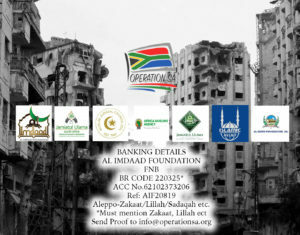 The public can continue donating on the website www.operationsa.org and donations can also be made via Whats App and SMS: 072 3 99 99 99.